Feature Story: Sustainable Energy MOOC a Success! Time flies! Powering Agriculture just concluded our first, very successful, Sustainable Energy for Food massive open online course (MOOC). Nearly 1,700 participants from around the globe (see chart) took part in the course, reviewing weekly videos and reading content, taking quizzes, and working in teams to submit group projects. The MOOC platform, including all materials and links, remains available online. The PAEGC team recently visited several Innovator project sites to review the implementation and learn about the benefits of their clean energy solutions. PAEGC visited three central solar PV systems that were installed by the Earth Institute in Gabar, Senegal to power 21 irrigation pumps. The farmers are saving up to 6 hours labor a day, spending less money on fuel and improving quality and quantity of grown produce. PAEGC recently completed a site visit to Rebound Technologies’ first SunChill demonstration unit in Inhacoongo, Mozambique. SunChill is an off-grid solution for pre-cooling agricultural produce as it is harvested and could save over 35 percent of cooling costs compared to conventional cold storage. Read more about Innovators in Action: Rebound Technologies, Mozambique. Read more about Innovators in Action: Camco, Benin and Tanzania. Latest Innovator and Partner Videos! 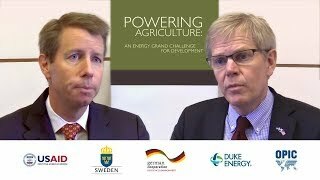 Powering Agriculture recently released a new video featuring speakers from the November 2015 Powering Agriculture Innovator Showcase. Hear what our Partners have to say about the clean energy/agriculture nexus. We have also added profile videos for the 2015 Innovator cohort. Learn more about their clean energy solutions. Powering Agriculture Partner GIZ recently established a regional hub in Nairobi, Kenya. The hub is linked to GIZ’s energy program, Energizing Development (EnDev) and will also provide support to PAEGC Innovators working in the region. Innovators are currently implementing projects at 15 sites throughout East Africa, with six projects active in Kenya. Hub activities will include support for pilot projects, capacity building, and knowledge management and exchange. The Powering Agriculture Xcelerator (PAX) program, in coordination with Kiva, will host a webinar for Innovators that discusses the benefits of becoming a Kiva Field Partner. Stewart Craine, the Managing Director of Village Infrastructure Angels (VIA)—a Powering Agriculture Innovator—will be participating in a webinar on “Failure and Off-grid Energy Success: Why Failure Matters to Development.” The April 20 webinar is hosted by The Low Carbon Energy for Development Network and Smart Villages. The Powering Agriculture Founding Partners will hold their annual meeting June 1-3, at USAID Headquarters in Washington, DC.